Box-Cox transformations (Box and Cox, 1964) are often used to find a power transformation of a dependent variable to ensure the normality assumption in a linear regression model. This example illustrates how you can use PROC MCMC to estimate a Box-Cox transformation for a linear regression model. Two different priors on the transformation parameter are considered: a continuous prior and a discrete prior. You can estimate the probability of being 0 with a discrete prior but not with a continuous prior. The IF-ELSE statements are demonstrated in the example. There are four model parameters: and . You can considering using a flat prior on and a gamma prior on . To consider only power transformations ( ), you can use a continuous prior (for example, a uniform prior from –2 to 2) on . One issue with using a continuous prior is that you cannot estimate the probability of . To do so, you need to consider a discrete prior that places positive probability mass on the point 0. See Modeling lambda=0. The PROPCOV= option initializes the Markov chain at the posterior mode and uses the estimated inverse Hessian matrix as the initial proposal covariance matrix. The MONITOR= option selects as the variable to report. The ODS SELECT statement displays the summary statistics table, the interval statistics table, and the diagnostic plots. The PARMS statement puts all four parameters, , , , and , in a single block and assigns initial values to each of them. Three PRIOR statements specify previously stated prior distributions for these parameters. The assignment to sd transforms a variance to a standard deviation. It is better to place the transformation inside the BEGINNODATA and ENDNODATA statements to save computational time. 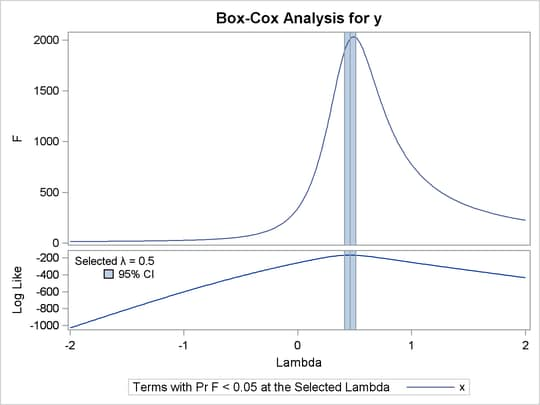 The assignment to the symbol ys evaluates the Box-Cox transformation of y, where mu is the regression mean and ll is the log likelihood of the transformed variable ys. Note that the log of the Jacobian term is included in the calculation of ll. 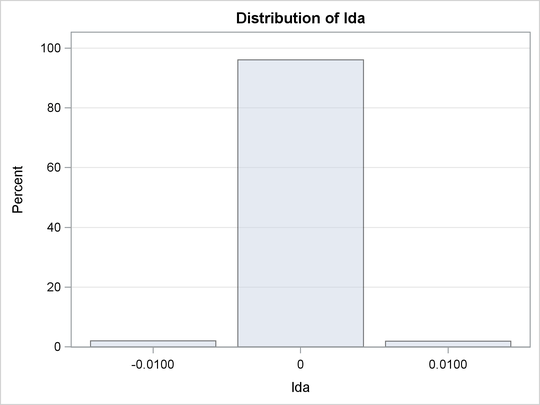 Summary statistics and interval statistics for lda are listed in Output 61.2.1. The posterior mean of is 0.47, with a 95% equal-tail interval of and a similar HPD interval. The preferred power transformation would be 0.5 (rounding up to the square root transformation). 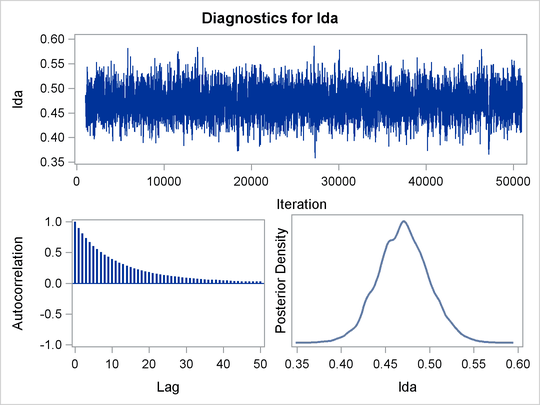 Output 61.2.2 shows diagnostics plots for lda. The chain appears to converge, and you can proceed to make inferences. The density plot shows that the posterior density is relatively symmetric around its mean estimate. To verify the results, you can use PROC TRANSREG (see Chapter 104: The TRANSREG Procedure) to find the estimate of . Output from PROC TRANSREG is shown in Output 61.2.5 and Output 61.2.4. PROC TRANSREG produces a similar point estimate of , and the 95% confidence interval is shown in Output 61.2.5. The estimated 90% confidence interval is , which is very close to the reported Bayesian credible intervals. The resemblance of the intervals is probably due to the noninformative prior that you used in this analysis. With a continuous prior on , you can get only a continuous posterior distribution, and this makes the probability of equal to 0 by definition. To consider as a viable solution to the Box-Cox transformation, you need to use a discrete prior that places some probability mass on the point 0 and allows for a meaningful posterior estimate of . where and are two constants. This places equal probability mass on five points, –2, –1, 0, 1, and 2. This prior might not work well here because the grid is too coarse. To consider smaller values of , you can sample a parameter that takes a wider range of integer values and transform it back to the space. For example, set alpha as your model parameter and give it a discrete uniform prior from –200 to 200. Then define as alpha/100 so can take values between –2 and 2 but on a finer grid. There are two parameters, s2 and alpha, in the model. They are placed in a single PARMS statement so that they are sampled in the same block. The parameter s2 takes a gamma distribution, and alpha takes a discrete prior. The IF-ELSE statements state that alpha takes twice as much prior density when it is 0 than otherwise. Note that on the original scale, . Translating that to the log scale, the densities become and , respectively. The LDA assignment statement transforms alpha to the parameter of interest: lda takes values between –2 and 2. You can model lda on a even smaller scale by dividing alpha by a larger constant. However, an increment of 0.01 in the Box-Cox transformation is usually sufficient. The SD assignment statement calculates the square root of the variance term. The log-likelihood function uses another set of IF-ELSE statements, separating the case of from the others. The formulas are stated previously. The output of the program is shown in Output 61.2.6. From the summary statistics table, you see that the point estimate for is 0 and both of the 95% equal-tail and HPD credible intervals are 0. This strongly suggests that is the best estimate for this problem. In addition, you can also count the frequency of among posterior samples to get a more precise estimate on the posterior probability of being 0. Output 61.2.7 shows the frequency count table. An estimate of is 96%. The conclusion is that the transformation should be the appropriate transformation used here, which agrees with the simulation setup. Output 61.2.8 shows the histogram of .